Jerusalem police to restrict entry of Muslims to the Temple Mount on Friday, due to information about Arabs intending to riot. The chief of the Jerusalem District of the police, Yossi Pariente, decided on Thursday evening that the entry of Muslims to the Temple Mount compound will be restricted on Friday. The decision was made after information was received about Arabs intending to riot on the Temple Mount at the end of Friday prayers. Entry to the Temple Mount will only be permitted to men age 40 and older who have Israeli ID cards. Women of all ages will be allowed entry. Police forces will be deployed in eastern Jerusalem and the Old City starting from early Friday morning in order to prevent disturbances. On Thursday, two Arab rioters were arrested for attempting to attack MK Moshe Feiglin (Likud) as he visited the Temple Mount. Hundreds of rioters threw rocks at Feiglin and several individuals who accompanied him. Feiglin was forced to leave the site, and police took steps to break up the riot. 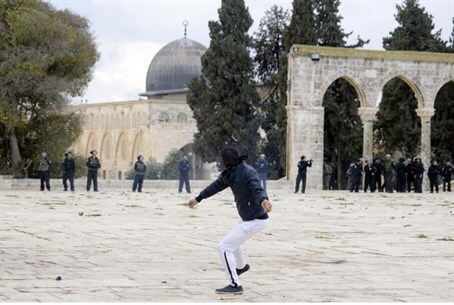 As a result of the riot, the Temple Mount was closed Thursday morning to Jews and to tourists. On Sunday, Housing and Construction Minister Uri Ariel (Jewish Home) was also forced to leave the Temple Mount after rioters threw stones at him. Then, too, police cleared the Mount of non-Muslims. The Temple Mount is Judaism's most sacred spot. Israeli police, in an attempt to appease the Muslim Waqf which was left in charge of the Temple Mount compound after the 1967 Six Day War, ban Jews from praying or performing any other form of worship. Police sometimes close the Mount to Jews altogether in response to Muslim riots - for days or weeks at a time - despite evidence that such violence is usually planned in advance for the specific purpose of forcing Jews out.